Additional FAQs to help identify floor tiles that are likely to contain asbestos. This article series assists building buyers, owners or inspectors who need to identify asbestos materials (or probable-asbestos) in buildings by visual inspection. We also provide a MASTER INDEXto this topic, or you can try the page top or bottom SEARCH BOXas a quick way to find information you need. These questions and replies on how to recognize asbestos-containing flooring were posted originally at ASBESTOS FLOORING IDENTIFICATION- topic home. 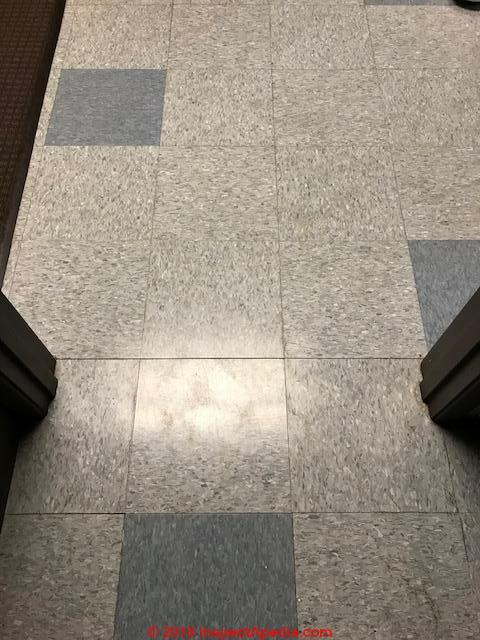 Review the 5 questions we pose there to make a reasonable guess at whether or not a particular floor tile or sheet flooring contains asbestos. Also see ASBESTOS FLOOR TILE PHOTO ID REQUESTS for more photographs submitted for identification as asbestos-containing flooring - or not. Quite possibly one of the four materials I see in the photo is asbestos-containing sheet flooring. Please take a look at ASBESTOS FLOORING IDENTIFICATION where we give 5 steps that help decide the probability that tile or sheet flooring contains asbestos. Let me know if that helps you or if questions remain. Vinyl with a backer, considering age, if in the U.S. or Canada, good chance of containing asbestos. 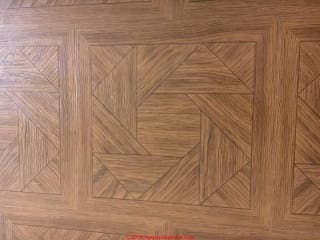 Can anyone tell me what this flooring is made of? It was installed circa 1979. Can anyone tell me what these floors are made of? They were installed circa 1979.
we give 5 easy steps for you that will be more complete and useful than just saying, here, sorry Carrie but as there were tens of thousands of floor tile patterns, even after decades on this topic I still don't recognize them all. Grace, it would be prudent to treat the floor in your photo as presumed to contain asbestos - which is not a reason to panic but it is a reason to avoid creating dust and debris. 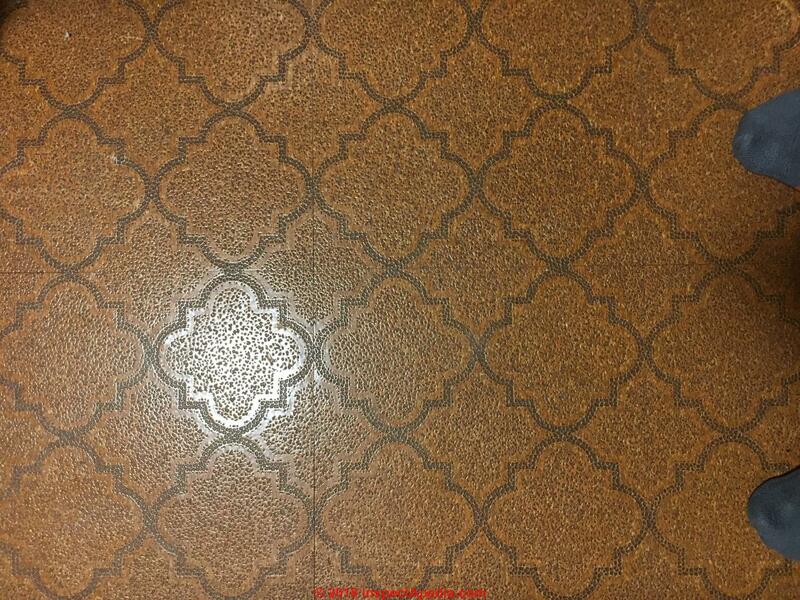 It looks generally like a cork-style or spatter style pattern made by Armstrong, Sears, Wards, Kentile and some others. 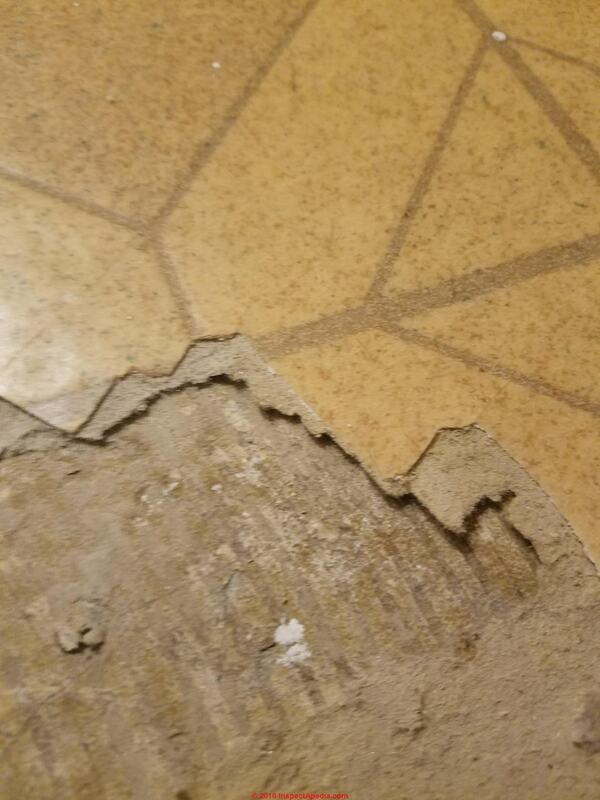 Can you identify this 9"tile; asbestos or not. Not sure which pattern it is so if you know what pattern it is, it would be greatly appreciated. Thanks for having this great site! Yes the floor is very likely to be a vinyl asbestos tile. Sure to read our articles about leaving such floors in place as the safest alternative. If those are vinyl tiles that were made before the early 1980's it would be prudent to treat them as presumed to contain asbestos - which is not a reason to panic but to avoid creating dust and debris. Looks to me also as if there has been water entry. My home was built in 1968. These are the tiles under the top peel and stick tiles. Under these old tiles the concrete is black. 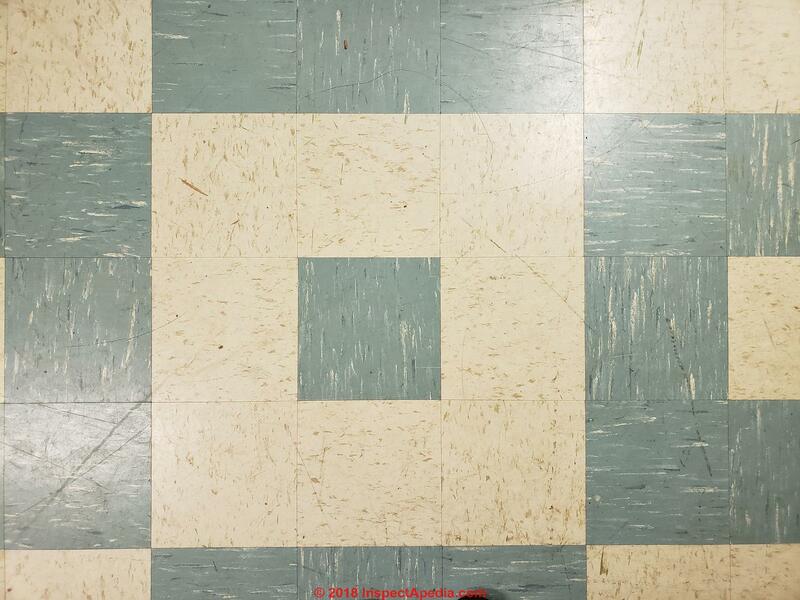 The flooring in your photos looks like asbestos-containing sheet flooring from the 1960's - 1970's. It would be prudent to treat it as presumed to contain asbestos. 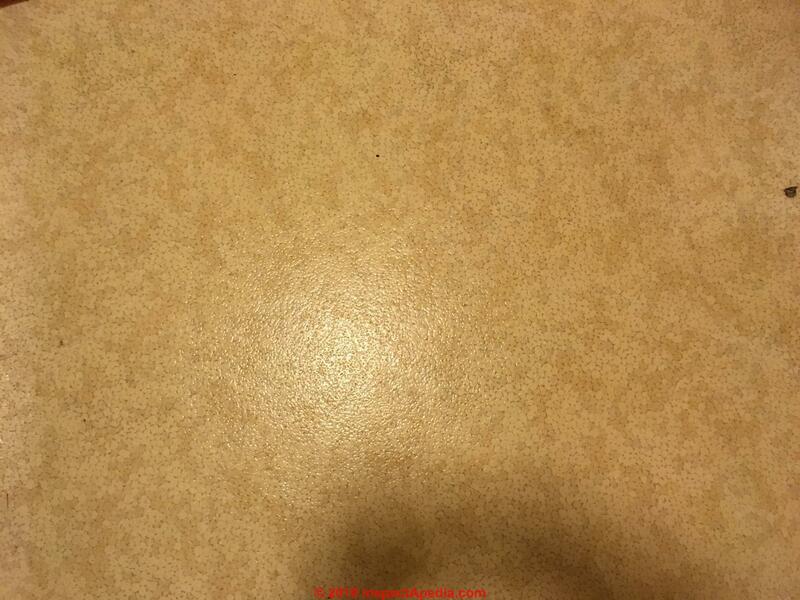 We have published similar photos of this flooring that I inspected in a home in Two Harbors MN. 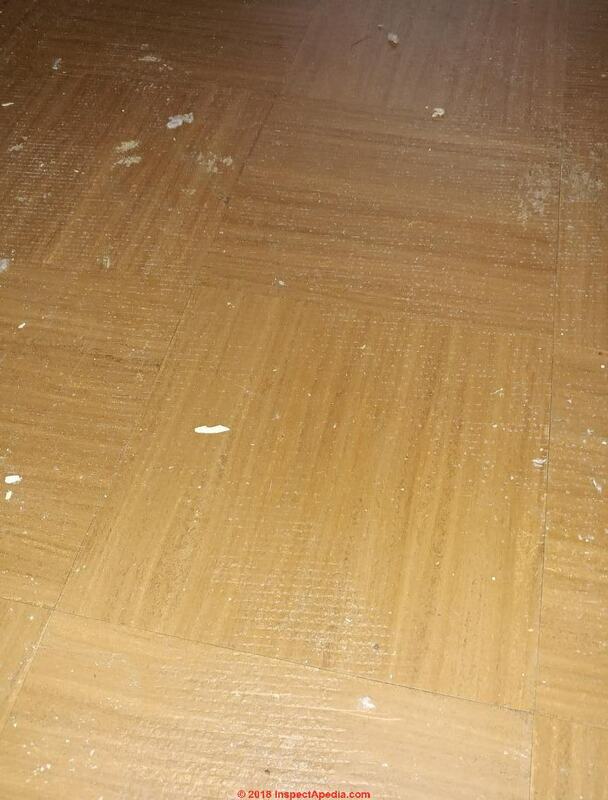 Here is another photo of the same/similar flooring. 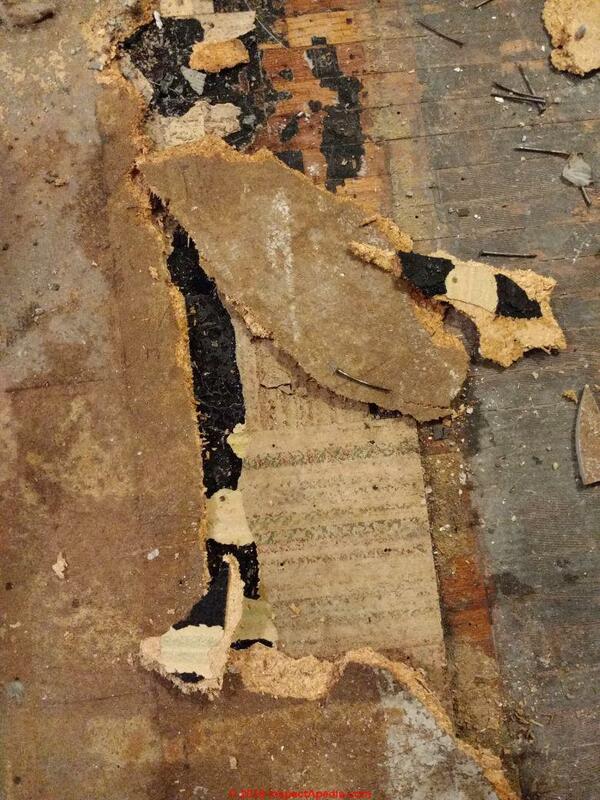 I'm trying to identify this sheet vinyl flooring, and figure out whether it contains asbestos. It covers the entire second floor of my home. In the bedrooms and hallway, wall-to-wall carpet was installed directly overtop - in the bathroom, new sheet vinyl was glued down over it. It's got to be older than 1980, because I remember seeing the same flooring in Victoria General Hospital (Pembina Hwy) in Winnipeg, Manitoba, Canada where I live. The pattern can best be described as small tumbled uniformly-shaded squares/blocks. The photos I'm uploading are from an internet search - from "photo collector" websites that hide the sources, and contain viruses. 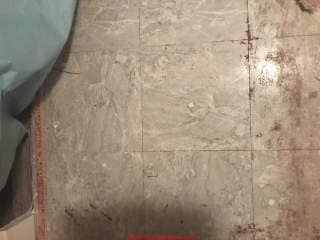 buying a house built in 1973 and homeowner won't allow us a buyer paid asbestos test of floor tile that I question. 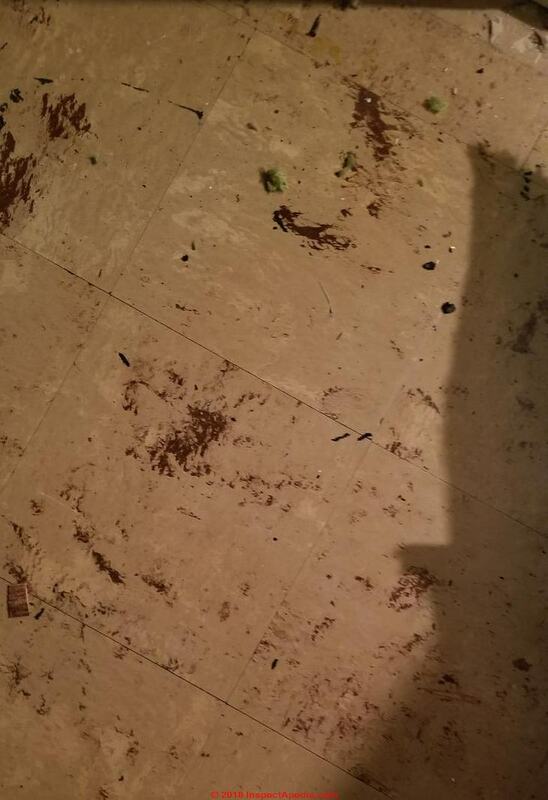 the tile is broken and cracking in areas. I feel the seller doesn't want to pay for removal or positively allow us to Id asbestos as then they must disclose it as they are saying they don't think it is. What country, city, state or province is the building location? The building is in Poulsbo, WA. West of Seattle. I’ll have it tested. I am trying to identify these 12 x 12 tiles. I have not found anything similar on the web site yet. Could you help identify it? It is in a medical building built around 1970. Thanks. Thats not a pattern we recognize. 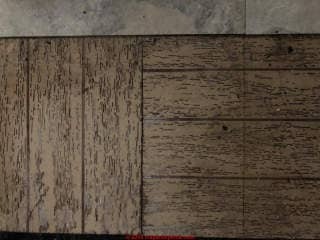 If the floor is in a U.S. home and dates from 1984 or later it's less likely to contain asbestos. The 12x12 floor tiles abovce are rubbery and flexible, the 9x9 tiles and tar papery underside are resistant to water (water beads up on the surface). 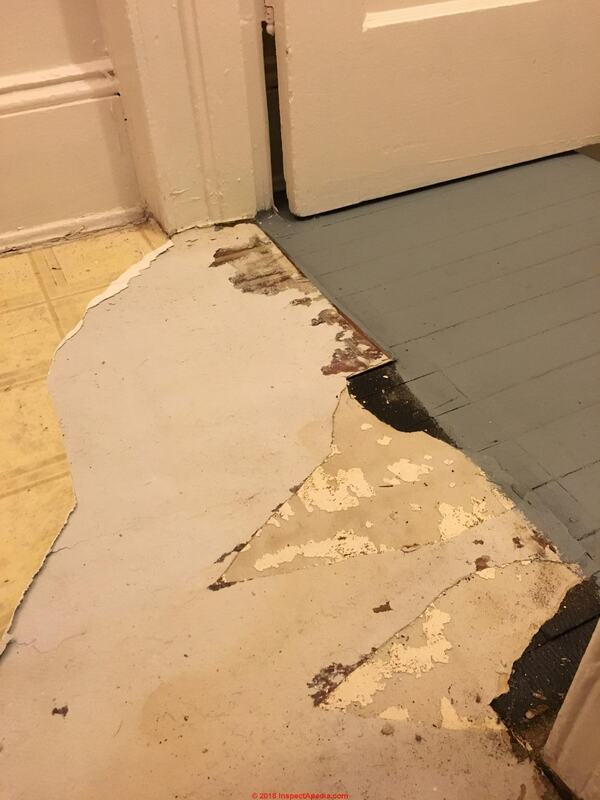 Are either of these tiles likely to be asbestos and would we be able to remove the partial board paint and seal the 9x9 layer and go over with wood flooring or is leaving it as is advisable. We are pulling up flooring in our home that was built in 1946 and have 2 different tiles on different layers of the same floor. The larger pattern tiles are on partial board and are 12x12. Under the partial board there are smaller 9x9 tiles. Terri if the floor is in the U.S. and went down before the mid 1980's it might contain asbestos. Attaching pic. Started to take up floor and was told it could contain asbestos. Now I'm afraid to continue. Any advice? You can post a picture by starting a comment - typing in the Comments box on this page. Then click the little "picture frame" icon just to the right of the gray Comment button and you'll see an opportunity to specify an image file to be included in your comment. Continue reading at ASBESTOS FLOORING IDENTIFICATION- home, or select a topic from closely-related articles below, or see our complete INDEX to RELATED ARTICLES below. 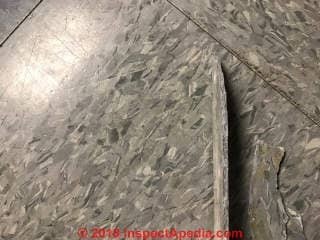 ASBESTOS FLOOR TILE IDENTIFICATION FAQs-5 at InspectApedia.com- online encyclopedia of building & environmental inspection, testing, diagnosis, repair, & problem prevention advice. Green linkshows where you are in this article series. Use the "Click to Show or Hide FAQs" link just above to see recently-posted questions, comments, replies,try the search box just below, or if you prefer, post a question or comment in the Comments box below and we will respond promptly.